It is indeed cold outside and the heroine could let the cowboy warm himself at "...the nuclear reactor in her pants..." BUT, will she? Because naturally they hate each other at first. Besides, she's seen his type before and, "...he ain't the marryin' kind." But, it is cold outside. 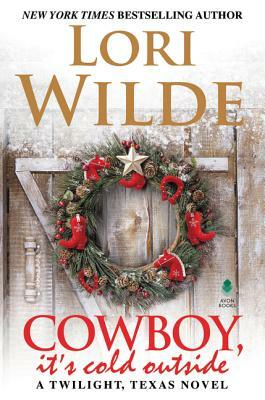 So, read the book and see if the cowboy's damnable pride causes him to freeze to death out on the frozen range of if he eventually warms his tootsies at that radioactive fire he started. Lori Wilde is the New York Times, USA Today and Publishers’ Weekly bestselling author of 87 works of romantic fiction. She’s a three-time Romance Writers’ of America RITA finalist and has four times been nominated for Romantic Times Readers’ Choice Award. She has won numerous other awards as well. Her books have been translated into 26 languages, with more than four million copies of her books sold worldwide. Her breakout novel, The First Love Cookie Club, has been optioned for a TV movie. Lori is a registered nurse with a BSN from Texas Christian University. She holds a certificate in forensics and is also a certified yoga instructor. A fifth-generation Texan, Lori lives with her husband, Bill, in the Cutting Horse Capital of the World; where they run Epiphany Orchards, a writing/creativity retreat for the care and enrichment of the artistic soul.